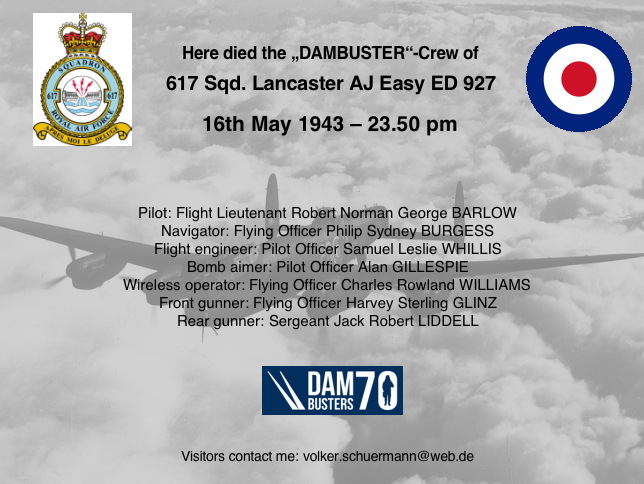 One of this blog’s growing number of German readers, Volker Schürmann, has contacted us to say that he plans to commemorate the Dams Raid crash of AJ-E on 16 May. He is writing a report for a local history club in Haldern, where he lives. AJ-E, piloted by Norman Barlow, was the first of the five aircraft tasked with attacking the Sorpe Dam to leave Scampton (after Joe McCarthy was delayed by a fault in his designated Lancaster) but came down shortly before midnight. It is not clear whether it was shot down or crashed after hitting high tension electric wires. In any case, the top secret mine did not explode, so within a few days of the Dams Raid, the Germans were able to find out exactly the full details of what had been used. Volker has also unearthed this brief biography of AJ-E’s flight engineer Leslie Whillis, for whom the Dams Raid was his 23rd operation, in a report of an auction held in 2001. Any more information about events in Germany to mark the 70th anniversary of the raid would be gratefully received. Please contact me here. Although the Nazis recovered the Top Secret device intact, they did not work out that it had to be spinning to be effective–hence the failure of their own attempts to build one that worked–thank god. What a noble gesture by Herr Schürmann. Thank you. That’s not true, Philip. The Germans did realise that the bomb had been spinning before it was launched, though they were not sure whether it was spinning forward or backward. See Sweetman, The Dambusters Raid, p.231. The only known technical drawings of Upkeep in existence are those that were completed from the capture of Barlow’s weapon. These full technical drawing were completed within ten days. Any nation as technically gifted as the Germans would have no difficulty working out whether it needed to be spun forward or backwards!